On Saturday, January 21, 2017, hundreds of thousands of people will gather in Washington D.C. and in hundreds of cities around the world. On that date, from noon to 2 p.m., we will march in Kings Beach, California. This is a local event for those unable to travel to Washington D.C. Instead, we will march in solidarity with the Women’s March on Washington here on the North Shore of Lake Tahoe. Please join us at the North Tahoe Event Center in Kings Beach at 11:30 a.m. All are welcome, including women, men, and children. We stand together in solidarity with our families and children for the protection of our rights, our safety, our health, and our community — recognizing that our vibrant and diverse citizens are the strength of that community. The rhetoric of the Presidential campaign of 2016 has insulted, demonized and threatened many of us — women; immigrants (with or without papers); those with diverse religious faiths, particularly Muslim,; people who identify as LGBTQIA; Native and Indigenous people; Black and Brown people; people with disabilities; the economically impoverished; and survivors of sexual assault. We are confronted with the question of how to move forward in the face of national and international concern and anxiety. In the spirit of democracy and honoring the champions of human rights, dignity and justice who have come before us, we join in solidarity to show our presence in numbers is too great to ignore. We call on all defenders of human rights to join us. The Women’s March will send a bold message to all Americans, and to the world, that women’s rights are human rights. We stand together, recognizing that defending the most marginalized among us is defending all of us. Please join us. This is an inclusive march, and everyone who supports the march’s goals is welcome to join this peaceful gathering! We will gather at 11:30 am on Saturday, January 21st at the Event Center in Kings Beach. Please RSVP at http://bit.ly/2jd4fGW to let us know you plan on attending. This is big! There are hundreds of marches planned across all 7 continents, and hundreds of thousands of people people have signed up worldwide. So far, more than 140 community members are expected to be in the March on Saturday, a number that will likely rise before Saturday. Please join us! 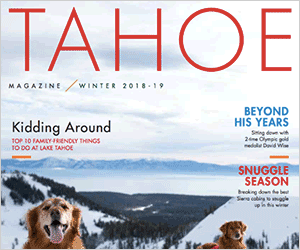 This column was co-written by Heather Segale, West Shore; Megan Ahlburn, Kings Beach; Theresa May Duggan, Tahoe Vista; and Anna Ellis, Truckee.